A friend was recently at a wedding outside of Reykjavik where, midway through his speech, the best man suddenly caught sight of his watch and cut himself off. ‘It’s nearly time for the fight!’ he announced. The whole party, octogenarian grandparents included, rushed into the next room to watch Iceland’s national hero, Gunnar Nelson, exchange blows with Zak Cummings in a ceremony that, just briefly, unified the fates of two human beings using a very different sort of ring. In Reykjavik itself the bars and public halls echoed the jubilation of the crowd at UFC Fight Night 46 in Dublin as, with seconds to spare in the second round, Nelson put his terrifying mastery on the ground to use and choked the American out, surely securing for himself a shot at the top ten in the process. The 26-year-old fighter is the seemingly unstoppable crest at the top of a wave of MMA-mania that is sweeping Iceland. 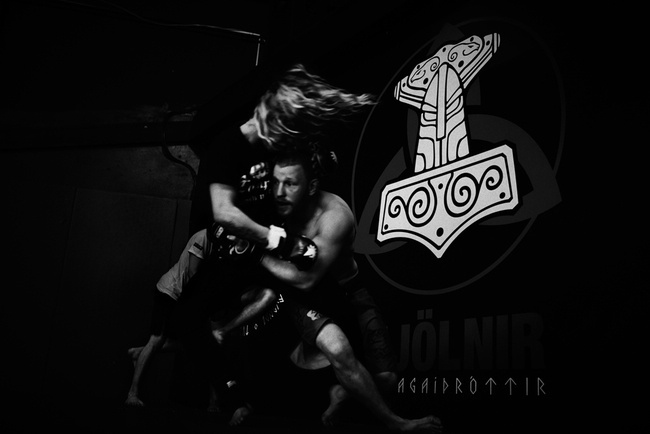 The sparsely populated country’s first dedicated MMA gym, Mjölnir—named, perhaps inevitably, after Thor’s famous hammer—was only founded in 2005 by ex-special forces marksman Jon Vidar and, at the time, counted just ten dedicated martial artists amongst its members. 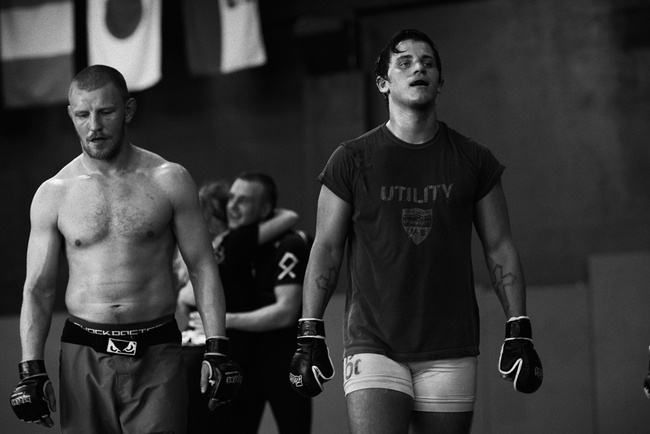 Thanks in part to the fame of Gunnar Nelson, referred to affectionately as ‘Gunni’ by most Icelanders, a framed portrait of those original ten now hangs proudly on the wall of Mjölnir’s new state-of-the-art facility in downtown Reykjavik, and the club now claims a membership of over 1,300 MMA enthusiasts. Considering the county’s citizens number little over 300,000 that is a sizable chunk of the population, and several copy-cat gyms have sprung up alongside Mjölnir to accommodate even greater numbers. In spite of this, the position of MMA—and combat sports in Iceland generally—is far from secure. There is a war being fought over the sport, and what those opposed to it lack in strength of numbers, they more than compensate for with the volume and pitch of their complaints. One of Iceland’s most famous TV personalities, a fairly well respected man called Egill Helgason, sent a ripple of anger across the muscled flank of the martial arts community—an unwise move for a man who is seemingly built from nothing but blonde ringlets and soft underbelly—when he used his column to launch an extraordinary attack. "When I first watched a video of the so-called ‘sport’ that Gunnar Nelson conducts," he writes, "unappetizing was the word that originally came to mind. But then I realized that was not a strong enough word. Truly, it is disgusting. Men jump around almost naked, wearing only their underwear, and then all of a sudden they drop to the floor to strangle each other and beat and scratch each other so that the blood flows." MMA, he concludes, "is nothing but the glorification of violence and assault." While this man’s revulsion at the sight of the human body is perhaps something that should be worked out with a therapist, his feelings are important to note because it is precisely this sort of ignorance, and the fear born of it, which has kept MMA illegal in Iceland. "The only reason we don’t get shut down by the cops," Gunnar Nelson jokes, "is because most of the cops train here too." There is no denying the fact that, from a distance, the UFC does look like some sort of sick Caligulan game show—the gladiators of Ancient Rome given an MTV makeover. When I first saw a man pinned on his back in the Octagon by an opponent who mercilessly rained down blows until his face poured with blood, my first thought was that dystopia had finally arrived. To the untrained eye it gives off every appearance of unrestrained violence and aggression—more like a war than a sport. When I meet with Gunnar and his father-manager Haraldur at Mjölnir, this is the sort of impression that they are both keen to dispel. "This sort of thing always comes out after one of Gunni’s fights," his father explains. "Obviously it’s very tough and obviously it’s not for all. Some people just don’t like combat sports. And that’s fine. I don’t like every sport. I think it’s ridiculous to jump out of a plane and pull a string and hope your parachute opens or you’re dead. But the guys who do like to do that know it’s a lot safer than it looks. It’s the same with MMA. Serious accidents almost never happen. MMA is safer than a lot of sports—if something goes wrong when you are parachuting then you are dead, but in MMA you can just tap out. It’s easy." How does it feel, I ask, to see your son come face-to-face with people who are looking to knock him out? "For me it’s a mixture of excitement, stress, pride and enthusiasm. I thought it was the most beautiful thing how he set up the choke in his last fight, with those stinging blows to the stomach and the ribs. They were hard shots. Nobody hits that hard. BAM! A hit to the stomach! BAM! Another one to the head! That guy wanted out of there. It was beautifully done and of course I felt proud seeing him put his technique and hard training into live action like that," he says, looking adoringly at his son. Given the Scandinavian aversion to knockout sports—in Norway all sports involving knockouts are banned—I want to know if Gunnar’s tendency to eliminate his opponents with relatively bloodless holds and chokes is a deliberate PR move. "It’s just my style," he says, shaking his head, "I’ll finish the fight however. I would say that it’s definitely good for the appearance of the sport in this country that I am not some guy who goes in swinging like crazy. I stay calm; I don’t do the trash talk. I think it’s good for the sport to have someone like that." Both father and son see ignorance as the only thing standing in their way now. "We need an intelligent debate about the sport," Haraldur says, "and I am happy to talk to anybody about it on an intellectual level." "Me also," Gunnar says, "I try to reach out to everyone, to speak so that everyone can understand, the young people and the old people alike." "Gunnar is the best advertisement one can ask for," says Jon Vidar, the founder of Mjölnir. "He impresses everyone with his calm and collected mindset. He is one of our most praised modern heroes." While Reykjavik often seems like a sprawling garden of earthly delights where anything goes, Iceland as a whole is a culturally conservative nanny state. It took them until 1986 to legalize beer, so official acceptance of the harder stuff might be a long time coming. Icelanders guard their culture jealously. Glima—a form of ‘courtly wrestling’ developed by the Vikings, in which, as far as I understand it, competitors stand crotch-to-crotch in leather thongs and spin in circles, each attempting to toss the other over his head like a caber—is stubbornly preserved as the national sport. A recent survey revealed that Glima has less than four hundred active participants, and at the last national championship there were reportedly less than fifteen competitors. Rather than adapting to changing trends, in the eyes of many that is all the more reason to preserve the indigenous culture from dangerous foreign innovations. For these reasons combat sports have, historically, had a rough time in Iceland. Boxing was officially outlawed in 1956. ‘Boxing,’ declared the architect of the ban, "is one of the most unpleasing sports that Iceland has ever known. If a sport is defined as a healthy exercise, to make people healthy physically and mentally, then it is a false statement to call boxing a sport." "Things were more difficult back then," Haraldur reflects. "The only place we could train was with the soldiers on the old American military base. Many years and many kilos ago I used to train kickboxing with them. I had three fights, but it was nothing compared to what’s happening now, they were more like scraps really. It was much harder to get things done. One time I tried to have some equipment imported—gloves, bags, rope, and a few other things. The police seized it all, even the skipping ropes!" It is this old ban on fist fighting, and the continued existence of the outdated attitudes that put it in place, which today prevents the thousands of MMA enthusiasts from holding competitions within their own country. It helps that Mjölnir goes out of its way to pay homage to the old traditions. The walls are covered with ancient runes and murals depicting scenes from the sagas. Grettir the Outlaw executes a rear naked choke on the ghoul Glámr across from the Octagon in which Gunnar hones similar tricks. "If the Vikings were alive today," Haraldur claims, "they would be training here at Mjölnir. Glima is a nice old Icelandic thing, but the true, ancient warrior spirit of the Vikings is here with us, inside of us." As I leave the gym, mulling these things over, an old lady calls down to me from a high balcony, a dark figure against the eternally bright sky. "You want to know why we love Gunnar Nelson?" she shouts, spitting out syllables like bullets. "We love him because he is like a heathen god!" With or without the Vikings and the Gods on their side, it seems like the conservatives have lost the war in all but the tiniest details. MMA has reached critical mass in Iceland and resistance, like the glaciers, must inevitably melt away. Perhaps uniquely, in Iceland MMA has pervaded all sections of society. In the gym I meet a woman who, as well as being a jiu jitsu champion, is also Professor of Statistics at the University of Iceland. "I see my students here," she says, "and sometimes I fight with them, sometimes I roll with them. On the mat everyone is your equal. There is no ego here." Out on the streets it’s a similar story—most of the bouncers working the doors downtown will give you a nod of recognition if you are wearing a Mjölnir t-shirt. "I like to employ people from Mjölnir," says one door manager. "They are better at staying calm and using their mouths instead of their fists. They put themselves in stressful situations with their training so they find it easy to keep a level head when they are working on the door, and that calms people down. Everyone has a bad night once in a while. Maybe your girlfriend dumped you. You get angry, want to get drunk and get in a fight. It’s normal. I like having someone who can stay calm and deal with that situation in a reasonable way, like the guys from Mjölnir do. It’s better for everybody that way." The next day Sunna Davídsdóttir, Iceland’s first female MMA fighter, invites me to join her and an American fighter called Matthew Semper for a run along Iceland’s black, volcanic coastline. 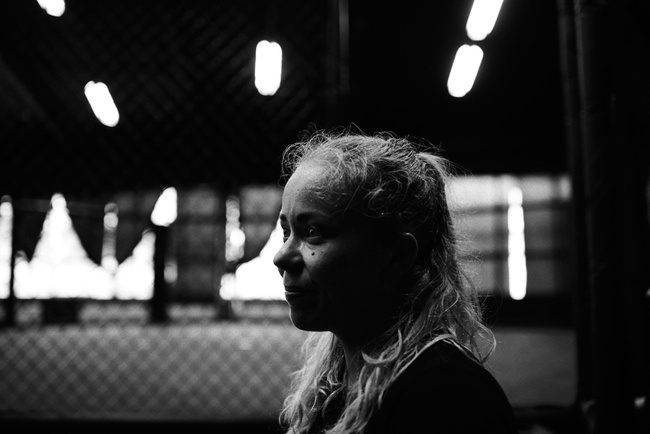 "I think everything that needs to happen has already happened for MMA in Iceland," she says. "The person to make the decision just has to make that decision. We are living it and dreaming it and doing it, they just have to allow it." 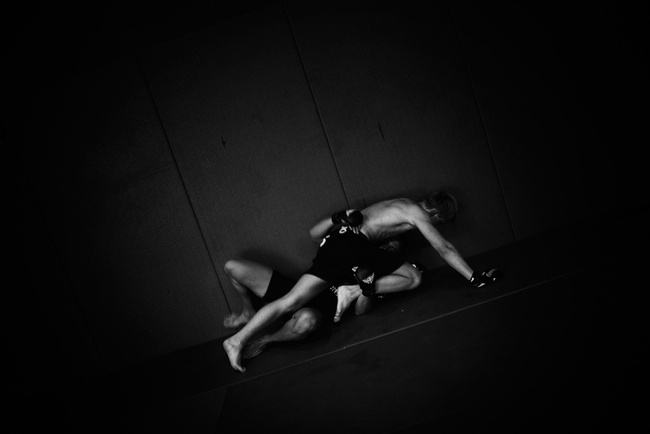 "People say that MMA teaches nothing but pure violence but its not true. My young daughter trains here, they have a class for kids. In the playground another girl tried to pick a fight with her. She knows how to drop someone to the ground, in a split second she could do some damage, but what she did instead made me so proud. She just stayed calm and let them know that she didn’t like the fight and she didn’t want to be a part of it. Then she just phoned me up and asked me to come get her, that’s what she’s learned from here. The opposite of violence!" I realize how deeply MMA has penetrated Icelandic society when we get back to the gym. The place is full of women with garlands of flowers in their hair, swigging beer from cans and giggling excitedly. "It’s a bachelorette party," Matthew says wearily. "It happens all the time. They pay a hundred dollars for the bride-to-be to face a Mjölnir fighter in the Octagon." "They emailed last night to make sure I would be fighting with my top off," says Thrainn, the heavily built coach who, when not rolling around on the ground with bachelorettes, trains the Icelandic Special Forces in jiu jitsu. "Who’s the bride?" I ask one of the garland girls. "She’s not here," she says. "She is round the corner drinking some shots before her surprise." "Is she a big MMA fan?" I ask. "No," her friends cackle, "but we are!" Relaxing on a sofa in Mjölnir’s lavishly decked out lounge after some gentle sparring with Matthew and Sunna, the future of MMA in Iceland seems hopeful. "Iceland is perfect, location-wise," says Ingunn, one of the managers of the gym. "We are right in the middle, between Europe and America, but we are isolated too, so foreign fighters can come here and focus only on training. We ran a camp for all of John Kavanagh’s fighters before the UFC in Dublin and it was really successful. Everyone had a great time, and they all won their fights. If it gets too much sometimes then it’s really easy to just get out into the nature and calm down, relax a little. This is what we love, what we do. Our vision is for Mjölnir to become the MMA capital of the world." It’s not hard to imagine this dream coming true. I only spent a few days training with the champions of Mjölnir, but with its friendly and relaxed atmosphere and close proximity to huge expanses of extraordinary natural beauty, the place seems like a Valhalla for martial artists. "Gunni’s going to bring back that championship belt within a year,’ Matthew says, gesturing to a space waiting to be filled on the gym’s wall of medals and trophies. ‘Some of these guys in the top ten hit pretty hard, but he can hit hard too. We are just going to have to bully him a bit more from now on, but that doesn’t really matter. On the ground he is God, once he’s sucked you down into his world it’s over. As soon as that happens it’s really going to explode in this country." Follow the author, Charlie Gilmour, on Twitter.